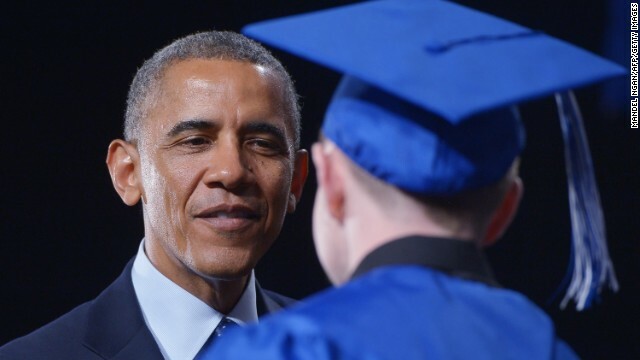 Worcester, Massachusetts (CNN) – One by one, as students from Worcester Technical High School walked across the stage in cap and gown to collect their diplomas they stopped to shake the hand of a very special commencement speaker, the President of the United States. Mr. Obama gave each one a hearty congratulations and a pat on the back. Some gave the President a hug and a peck on the cheek. There was a defining, high-pitched roar inside the DCU Center arena in Worcester where the commencement took place as Obama walked on stage. In 2006, Worcester Tech was one of the lowest performing schools in the state. Today, it's among the top high schools in Massachusetts with 95% of its students graduating within four years and many going on to college. The school's principal, Sheila Harrity, was recognized at the White House last month as a national principal of the year. In 2013, Worcester Tech became a U.S. Department Of Education Blue Ribbon School. President Obama came to this graduation ceremony to highlight a school that he called "a model for the rest of the country to follow." As he called on the nation to learn from Worcester Tech, the President commended the high school for producing graduates with skills that they'll be able to put to use in the work place right away such as rebuilding a car engine, running a restaurant and fixing a computer. He said they acquired the skills needed "to fix America." "The thing I really want to do here today is for the nation to learn from Worcester Tech," said President Obama. The school not only teaches students skills that they will be able to use in the job market right after graduation, Worcester Tech's is home to a beauty salon, community meals program and a veterinary clinic that are all well used by the surrounding community. In his speech, the President took a swipe at Republicans for blocking legislation sponsored by Massachusetts Sen. Elizabeth Warren that would allow people to refinance their student loans at a lower rate. When that elicited boos from some students President Obama said, "Don't boo, just remember to vote." As he talked about the importance of making a higher education affordable, he told the audience that he is not giving up on his goal to cap student loan payments at 10% of a person's annual salary. Most people would have a tough time recalling who their commencement speaker was at their high school graduation. It's safe to say that these students will never forget their special guest. Class president Reginald Sarpong sat next to the President on stage. Sarpong was just 11 years old when he came to the United States with his family from Ghana. Dressed in colorful traditional Ghanaian tunics while seated in the audience, his family was beaming with pride as they watched him chat with President Obama. Sarpong said it was difficult to maintain his composure. When he first learned that he was going to sit next to President Obama on stage, Sarpong said he thought it was a prank. "(Obama) asked me how I was feeling sitting next to him and he assured me that it was alright, that there was nothing to be worried about. He calmed my nerves," he said. All good news then McConnell doesn't want to help them with student loans. Such a sad old man. Must be all that extra skin on his face. -this president is just the best president. Education is needed here not wars. He just can't help himself. Always gotta be political. What a wonderful message to teach kids graduating high school. I was totally intrigued with the article and thought it was great he was there. But then he has to make it political and ruin it. Oh, and it would be really really nice to know what has led to the turnaround of that school. Seems like a fantastic story. Let me guess, the gang will say how great President Obama is and how lucky the students were (which they definitely were) and then they will make the "cue the hate" comments and not acknowledge that it's Obama who is the one that got political. Then their next step will be to say its repubs and the extreme right who's at fault. After 8 years of this Obama nightmare, nobody will be able to fix this country. Sorry kids, enjoy Obama's gift to you, $20 TRILLION in debt that you will have to repay and no good jobs in your field. But hey, most of you young dopes voted for this clown you will get what you deserve. The lesson to be learned, don't listen to snake oil salesmen that tell you they have all the solutions when they never actually did one thing in their life. Oh goody more lip service. Obumbles as usual just not up for the task at hand. This potus has none, zero common sense or credibility. Its clear he wants to destroy America. The students, parents and neighbors of Worcester Technical High School thank you for taking the time to visit these students on this big day. Don't let the pathetic haters who will call this a photo op get you down. They are so hate filled, they can't think straight. S0 much for hope and here's your change . I wish Obama had some skills to fix the economy. What? What does this have to do with anything that 's going on right now? And – all due to Obama's lawless actions? This is a total disconnect. Classy guy , he knows the respect and value that comes from achieving a diploma . Too bad Obama's abysmal skills at keeping America's economy health and strong has handicapped these kids from getting jobs. – why hire a US citizen when you can hire a criminal immigrant for half the cost? Why does this President feel he always needs to use a non political event to make a political statement rather than celebrate the achievements of these students who worked very hard over the years to meet this milestone. I'll wager 98% of those students are not aware of who Elizabeth Warren is, what her bill is all about or even care. Did Obama brag about how he left Iraq high and dry and now the country is being taken over by AQ? Why this failure is addressing kids is beyond me. Unless of course it is to show them that even abysmal failures can get ahead as long as they lie often enough and can read a teleprompter. Good job by the Senate for stooping Warren`s robin hood bill. The US needs to get back to self reliance and personal accountabilty instead of depending on the wealthy or others to help you meet your goals. Im not rich and I don`t hate the rich for being rich. Stop being jealous, its lame.